Posted: Thu Oct 25, 12 9:40 pm Post subject: Venison! The young man who hunts our property got a nice buck this morning. About 160 pounds, he thinks. I've tried to include a picture but keep getting a box that says the myff has expired. Anyhow - New Jersey has a law that hunters must first shoot a doe, as there are so many white tail deer running around the countryside (and not so country too.) He got a smaller doe a few weeks ago, very happy with this buck. Field dressed it, so foxes and crows are going to be happy. This weekend he'll bring me a forequarter, hind quarter, and back strap. I then finish butchering to my choice. Roasts, stews, chili . . . yumm. And if anyone can tell me a work around for the picture issue I'll put something up for you to admire. It's probably too big. I can reduce it for you if you want to email it me. Or the title has characters in that the software doesn't like. % and & signs are problematic IIRC. You could try just retitling it. I appreciate the suggestions Jamanda and Sean. I tried e-mailing the image to Jamanda and it had the same error message. The image is on my computer. It was resized down to 600 pixels by proportional. Click on "attach" Browse for the image, click on it, click on upload. This has previously been successful. I'm not titling the image, the Downsizer program is doing all of that. Do I need to play with the html code that the program creates? I even tried using the thumbnail gubbins and that didn't work either. Oh well. 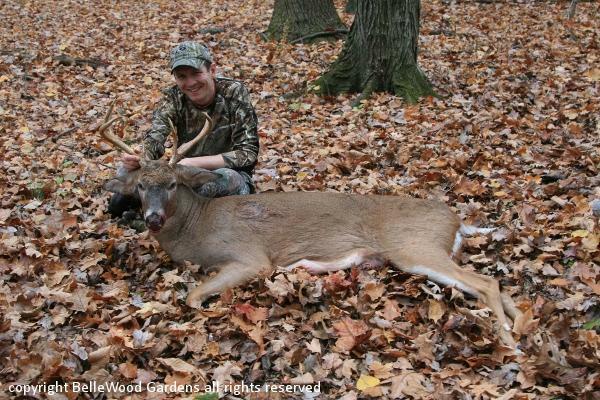 It's just a very nice image of a happily smiling young man kneeling in the leaves and holding up the head of this big buck. You all don't really need to see it now, do you? You're not titling it personally. The jpeg will have a file name on your computer though, if it contains characters that the software on downsizer doesn't like then you get the Myff image has expired message. Ah, you did it. I was just about to have a go. Congratulations, that's a good sized animal! It'll keep you going for a while. To be sure. But I don't have any. What I do have is grape jelly with thyme and rosemary. Think that will do? However with Hurricane Sandy bearing down on us I'm not sure what will be. OH has checked out the generator and we'll fill water jugs as if power goes out so does the well pump. Dining by candlelight may be a necessity rather than a romantic interlude. Having defrosted some pieces of boneless venison shoulder, last Sunday I put it through the coarse plate on the meat grinder, together with some boneless pork sparerib meat / fat. Made chili. Very good. That evening we were going over to friends for dinner. They provide vegetables and dessert, he grills steaks for the two of them and we bring something to be grill for us. I put some of the coarsely ground venison and pork through the grinder again, with a medium plate and used it for burgers. Excellent! Of course the chips from our friends home grown potatoes, green beans she'd processed and frozen last summer, and hen of the woods mushrooms I'd foraged and frozen last year weren't bad either. As an aside - I cubed the meat and put it in the freezer for an hour or so to thoroughly chill it down before grinding. Did the same before grinding a second time. I think it really helped. BTW - am I supposed to write "mincer" rather than "grinder" for you folks across the pond?